My art comes from personal expression - multilayered and complex - and being an artist is a fundamental need for me. I am a storyteller - line and colour is my language. 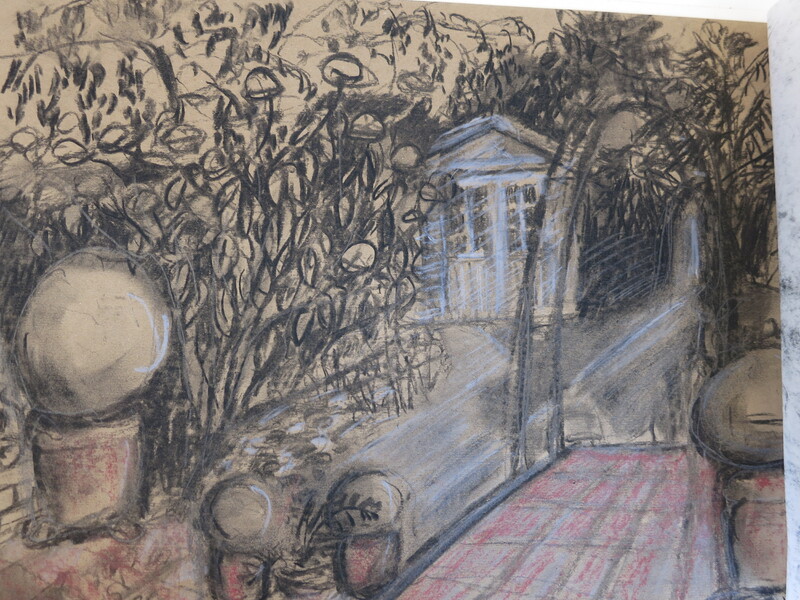 Light reveals glimpses of line, form and evocative colour, etching images in my memory. Two main themes have accompanied me for quite a while: the figure and the magic of place. I am an anthropologist with an admiration for the human figure - the fleshiness of Rubens, Francis Bacon and Lucien Freud, the sincerity of Rembrandt's self portraits, the immediacy of Kirchner's lines - just to name a few of my influencers. I am also a topophile person with a love of place, the terrain in which we live and this makes me aware of matter out of place -I am interested in how we cause changes in our surroundings. creating wasteland, disposed and disposable marring our falsely assumed notion of virgin forests, clear skies, pristine untouched landscapes. There is so much that occupies my mind and which I must communicate. But someone said," If you want to communicate, you've got to have good grammar". So this blog is all about me learning the "good grammar" of communicating with line and colour....it is all about progress. He studied under Robert Henri, who encouraged him to paint scenes from everyday life in a realistic manner.After a couple of trips to Europe he was interested in Degas and Manet’s depictions of urban life and These artists influenced him for many years. But unlike Manet, he strove to banish brushstrokes from his canvas, working in a very realistic manner. 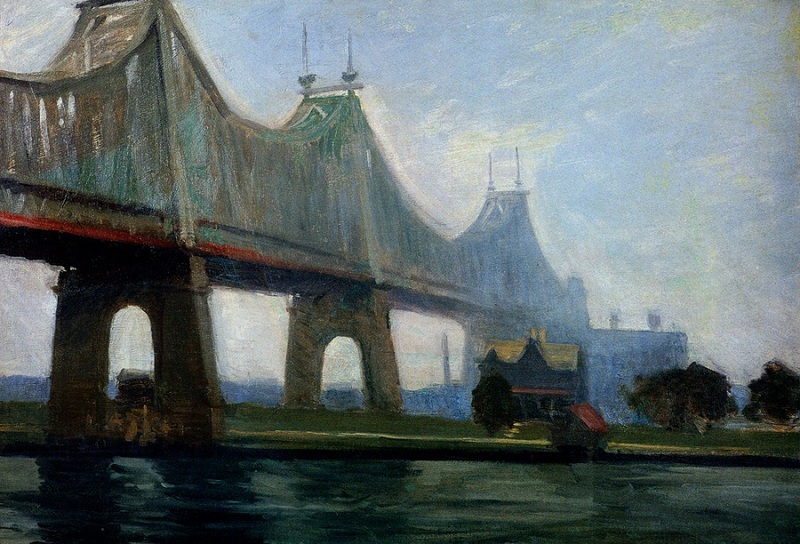 In Queensborough Bridge he has worked with atmospheric perspective with things getting fainter in the background and brushstrokes can be imagined. In Lighthouse Hill, fourteen years later, he worked with exactitude and a very strong source of light. He always managed to create scenes of tension and eeriness. His clearly outlined forms, the strong source of light and the cropped composition helped create this eerie stillness in his paintings. His images of buildings without unnecessary detail were either deserted or with just a few figures captured in a tension-laden situation. 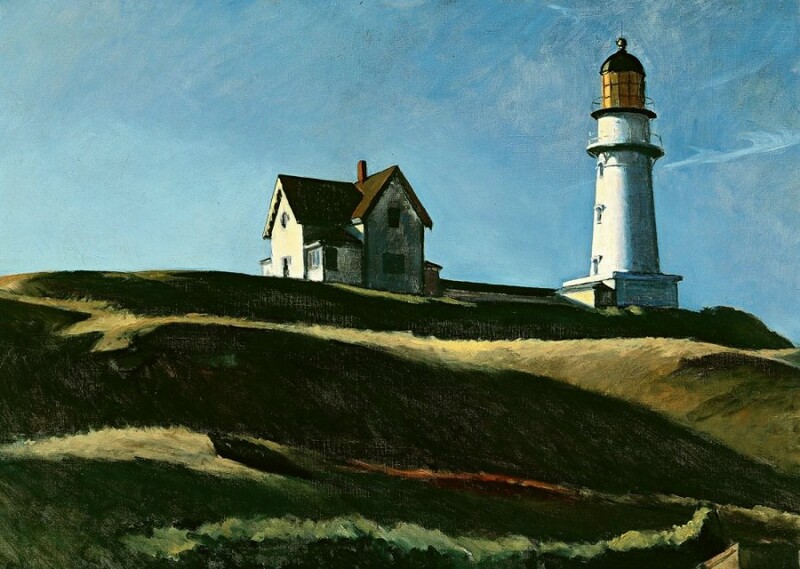 He made many sketches on the spot which he developed into one drawing and then went on to paint this without an exact concept – scraping and repainting until he was satisfied. This process of improvisation brought out more of what he wanted to say. These paintings could take even a year to be finished. I found that his paintings have a theatrical element as they are quite dramatic. By omitting and leaving things unsaid he created a sense of high suspense. There is something happening and his images are frozen in a moment, but chunks of narrative are missing. These vacuums occupy my imagination as I try to still my curiosity and fill in the blanks. The less one includes, the more compelling and encapturing. This could be an interesting approach for me – create emptiness and thus room for imagination. But how exactly did he create this? Although his scenes are bathed in a strong light, I notice that he often draws the eye into a region of darkness. 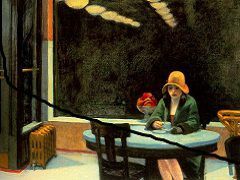 Does this induce this sense of fear, loneliness and despair which pervades his paintings? His figures are mostly placed off Center looking at a distant place where the Viewer cannot follow. His figures hardly ever communicate with each other – they are all deeply immersed in their own worlds, alienated from the rest. 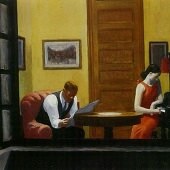 Even in his paintings of couples there is a deep sense of Alienation or disconnectedness. Looking at his desolate buildings, one tends to peep in through the windows at the people inside and imagine what they are doing. The viewer uses imagination to find the narrative. What is going on? Curiosity is awakened, something is happening and we are caught in the moment. Everything is cloaked in a blanket of emptiness and silence. I like the strong sources of light which he often uses and the fact that he either omits figures altogether or uses them sparsely and that they are sans facial features. The figures seen through windows makes one feel like a voyeuer. I think I could try using a strong source of light leading towards darkness and see what it does to my style of painting. I looked at the work of Richard Long (1945-), a Land-art artist who walks and measures using found objects to create his artworks. He never makes lasting alterations to the landscape, but marks his chosen places with stones. He also paints with mud like the women in Africa who paint their mud huts with earth-based pigments using their hands to create their traditional patterns. For him, walking as art is his way of exploring time, distance and terrain, somewhat like the Aborogines during their Walkabouts. I find this approach of using the pigments of the area to create very site-specific artworks interesting. 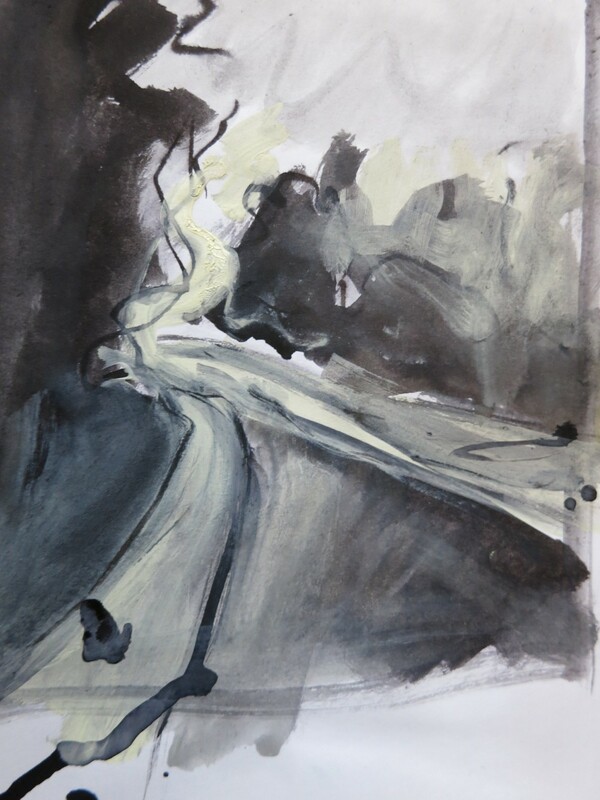 I’d like to try this painting-with-mud approach when doing some sketch walks along our local river. The mud would contain not only all the sludge, toxins and the negative imprint of man on nature, but also contain the DNA of the river – from source to point of extraction. Inspired by this approach, I collected some mud and sludge and dipped my paper in it, allowing the muddy water find ist own way. It is very fragile as the dried mud brushes off too easily – but I consider it a form of transient art. Perhaps I ought to have sieved the sludge to ensure that only fine sediment would be used. But I didnt want to mix in any medium. Could try this next time in Roussillion with the ochre in the earth – wonder if the rivers there have yellow sludge? 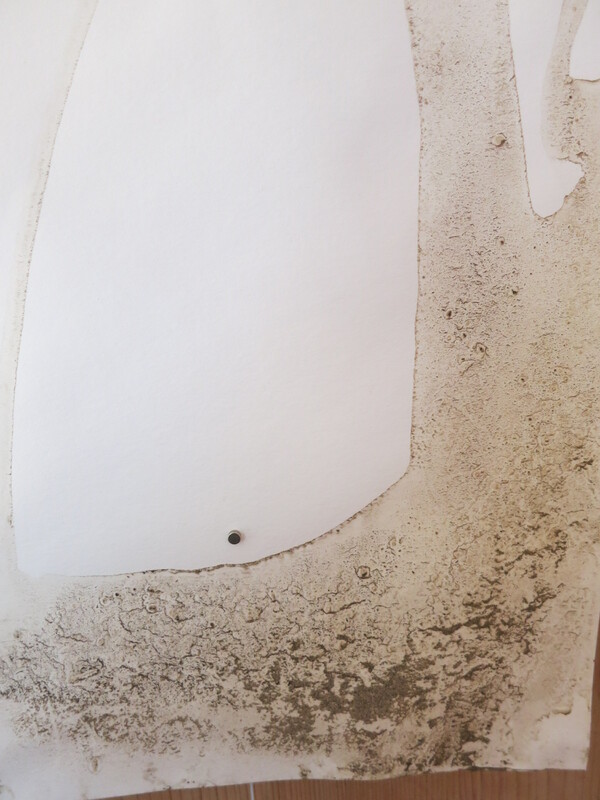 My Isar mud experiments on paper – an ongoing Project. 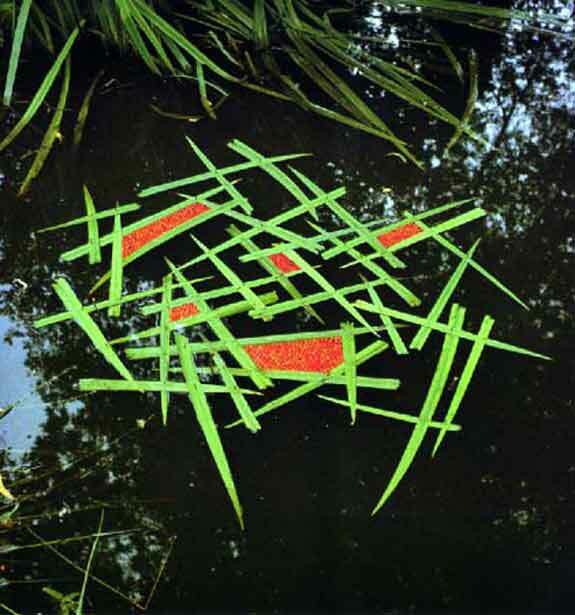 Another very interesting Land-art Artist I looked at was Andy Goldsworthy (1956-). He sets out with no idea what he wants to create and lets the materials he finds show him the way. He uses photography to record how his work grows and decays. His materials are flower petals, icicles, leaves and mud, pinecones, snow, twigs and even thorns to create. I like his idea of setting off with no preconceptions and using what he discovers to be inspired to create. These land artists are reverting to nature as a source of inspiration and materials, like children who roam through their terrain letting their creativity loose. 1)Iris leaves with rowan berries. 2)Ice spiral-treesoul. 3)Goldrock-goldleaf on rock All Andy Goldsworthy. Source: http://www.morning-earth.org. accessed 09.09.2105 I am still trying to figure out what caused the ice to create that perfect spiral against the force of gravity. 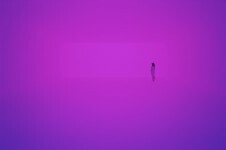 To round off this list I chose to look at James Turrell(1943-), an US Land-Artist who works with space and light. His studio is the sky. (He happens to be a pilot too like Lanyon). He says, “ We are living in a reality of our own creation“ and that he wants to create „an experience of wordless thought“. He creates other-worldly light spaces which he calls „landscapes without horizons“. I rather like this idea of moving into this realm of landscapes without horizons and of reducing art down to light. The Old Masters strived to capture light in their paintings. Turrel creates with light! This gets me inspired to get back to my vast canvasses of monocolour. How could the artists I have researched influence my own work? I like the recording Constable did on light, weather etc. 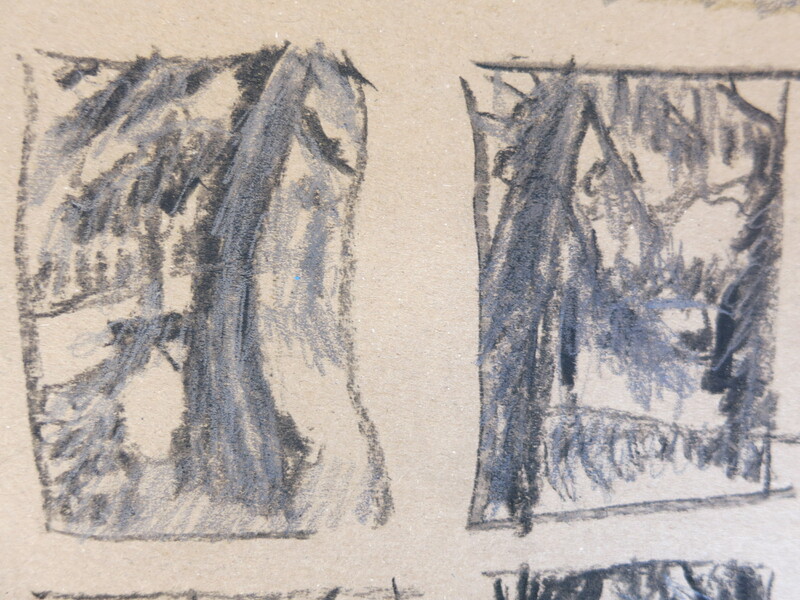 and that he did many preliminary sketches. I do adopt this discipline now so that in inclement weather I can finish off my work inside, but I actually prefer working plein air. I love those blocks of colour in Ivon Hitchen’s work and feel encouraged to omit detail, use broad brushes and enjoy my brushstrokes. This is something I already enjoy doing. James Turrel’s saying, „a landscape without a horizon“ and his light bathed spaces inspire me to look back on my hugh canvasses of monocolour – with thirty or more glazes to create a feeling of great depth. I cannot work with light as he does, but with pigments and glazes this astronauty feeling of weightlessness might be achieved. I have done some large canvasses using pure pigment and self-ground bits of lapislazuli, turquoise and other soft blue stones to create an expanse of pure colour.It did have an unearthly feel. But I didnt think of them as landscapes before. Now I could appropriate his expression and refer to them as a landscape without a horizon. I also like the idea of using found natural objects to create transient statements in nature. One makes these objects out of what one finds in situ, photographs it and leaves it for nature to repossess it. Very ecological and no toxic paints, no plastics, no unnecessary waste caused. Researching all those landscape artists was very interesting and there was much which can come in useful in my own work in future. Urban Art developed from the Graffiti Scene of the 70s, when it was a communicating tool to mark boundaries of minority youth groups in NYC and moved from simple messages to social issues. They used this means to comment on social issues or merely make statements. It was something illegal and underground. 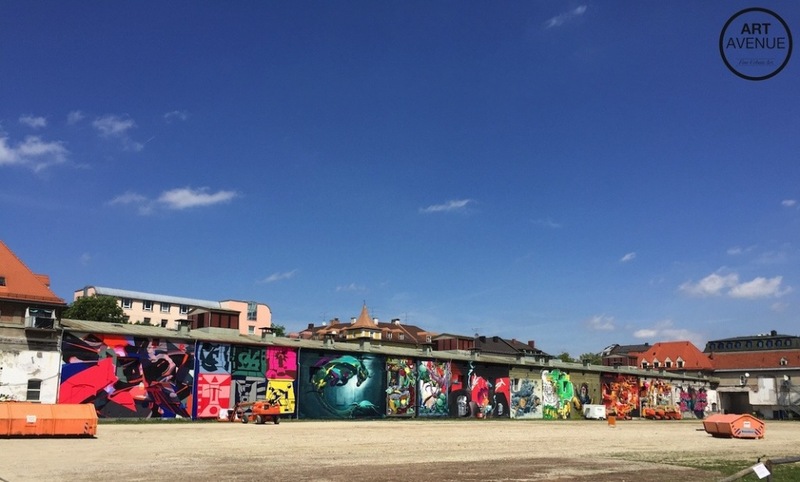 Billboards and advertising bombard the public – the artists in their turn started to use public spaces for their own messages in graffiti writings. 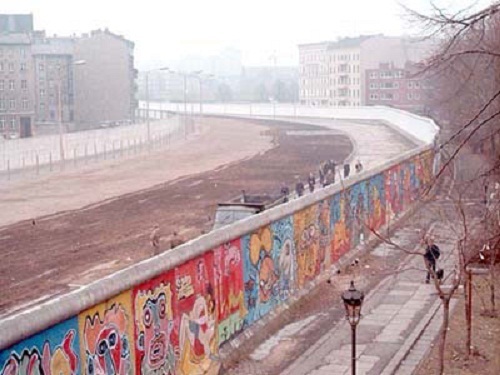 Berlin Wall and Graffiti on wall in Brooklyn NYC. With the development of new techniques and hand in hand with subcultures in the music and dance scene, the artwork developed into a certain lifestyle of irreverence, grass-roots democracy and freedom. The streets and walls carry the art, not galleries and the establishment. With time, new techniques, mixed media, stencils, charcoal, paint, collage, airbrushing and wheatpasting, a new sense of aestethics and the fact that art students and other artists were also discovering the walls as their canvas, kickstarted a post graffiti development. 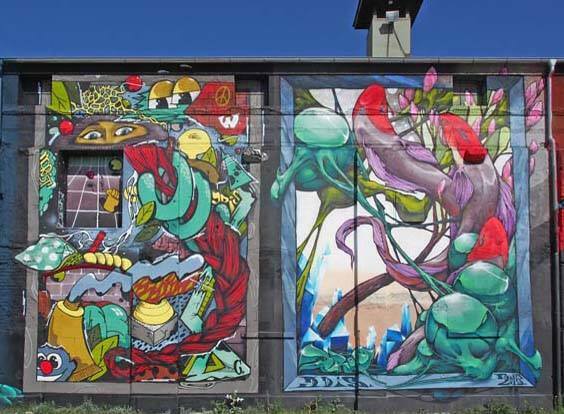 Today, urban art which developed out of graffiti has stepped out of the underground and is seen as a mainstream global art movement represented in museums, galleries and younger markets. It is commercially used by advertising agencies to reach a younger, modern consumer market, by property developers as an instrument for urban regeneration and by city marketers to encourage tourism. 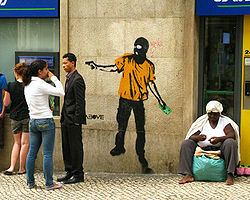 I discovered this film on https://youtu.be/Hi8WqdUjYQ8 showing how Lissabon used Street art to market their town in 2012. It grew from a territorial into a worldwide movement. 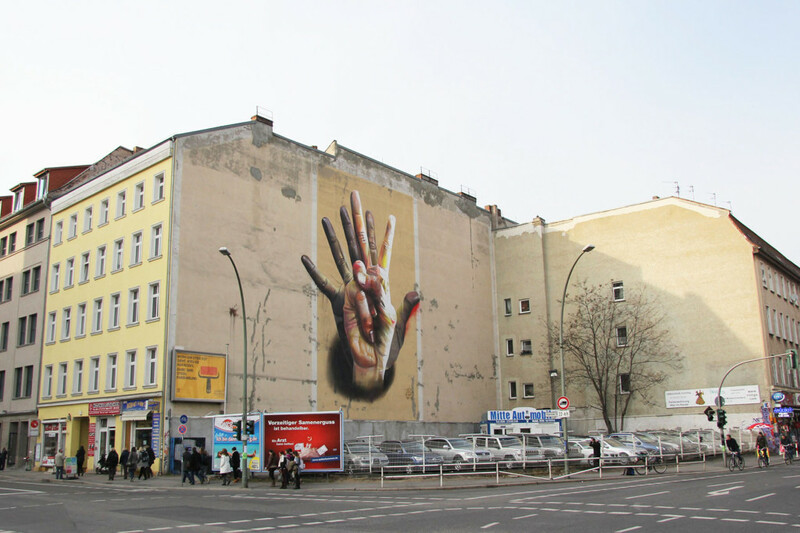 Creating the same image in different urban spaces in different cities became important. 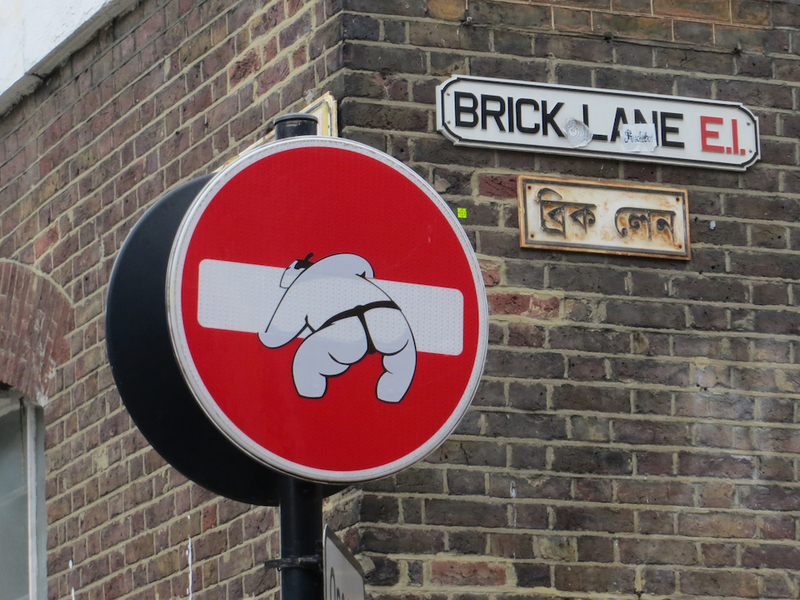 The artists travelled to other cities, where streets and walls were embellished. Repetition and accessibility either on the street or in internet became a defining feature. Herakut’s work (in Munich), still maintains the griminess and urgency of early street art and carry a strong political message. 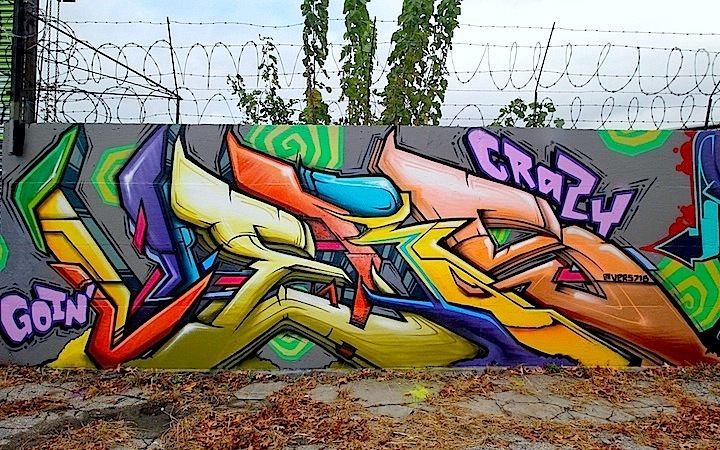 The duo, Hera and Akut have projects running in the refugee camps in Jordan, Gaza etc. Image Kind courtesy of http://www.herakut.de. Herakut is showing until Christmas at the Tollwood Festival in Munich represented by the MUCA Gallery. Herakut will also be holding a childrens painting session there before Christmas. Image 1. Banksy in Chinatown, Boston. 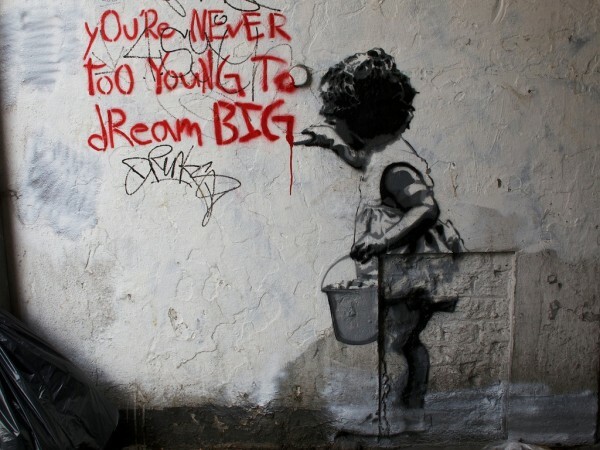 May 2011. source:sugoihcontemprhetoric.blogspot.com Image2) could be Banksy or not, as he doesnt sign his work. source: http://www.laist.com accessed 11.12.2015. I somehow like stencilled work with text. In Munich we have the annual Stroke Air Fair where sprayers and graffiti artists can be seen at work, street artists working on their hugh vertical billboards,knitters clothing street signs and tree trunks in colourful warming Jumpers, tape artists creating interesting work on light boxes among other urban artists. Seen at the Deadline, Munich. I often visit the Gallery MUCA (Munich Urban and Contemporary Art)in Munich at their Gallery openings. 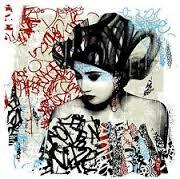 This Gallery has specialised in urban art showing Case, Herakut, Fairey and quite a few others, so I have even met the artists, as long as they have come out into the open. It is interesting to see their diversity and the high standard of most of their work. It has less to do with the Graffiti of early times. 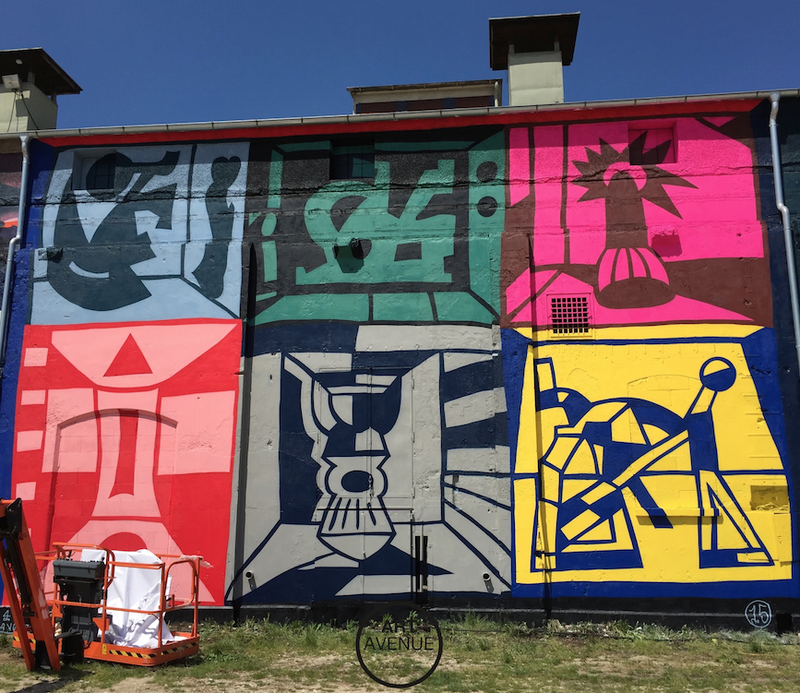 I am not a fan of the early Graffiti, as some time ago, a walk in the night through areas like Lower East Side or Berlin Kreuzberg was accompanied with a feeling of apprehension, as graffiti usually marked off rougher areas. 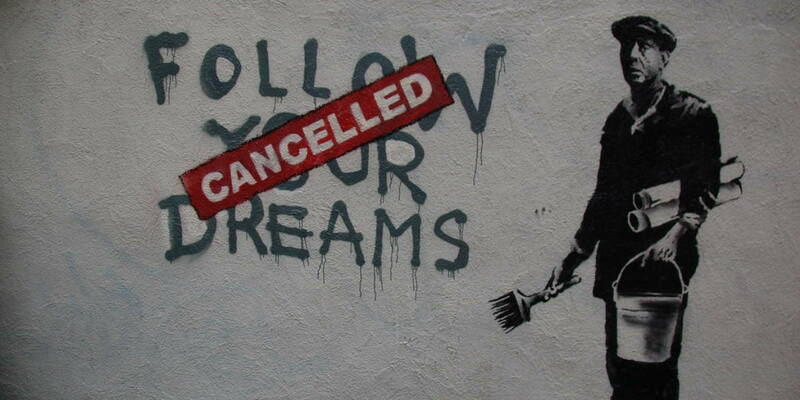 But I like the stencilled work with text messages, the likes of Banksy, alias and above. Hush’s work is almost too beautified and looks like advertising billboards, but would nevertheless look „pretty“ in a modern apartment. If I was collecting, I would go for the stencilled work with a message. At the last Stroke Art Fair in Munich I saw them stencilled on old wood flooring. It would be interesting to get hold of a few stencils and use them on a painted landscape. Imagine cutting out stencils of eg: The Girl with the Pearl Earring, The Dutch Milkmaid pouring out the milk and some other recognisable figures of Art History and stencilling them onto a modern context, a modern interior. There is something tongue in cheek about some of the work and I find Urban Art interesting as it is easily accessible and makes one stop and smile or stop and think. Somebody said:“Art for the masses is nothing but demagogy“ (sorry can’t remember who), but I find that resentment toward a given culture is to be found where there is dissatisfaction with the establishment or a feeling of exclusion. I am glad that the artists vented this dissatisfaction on artistic terms to be read by any and everyone so that the viewers can reflect on the message being conveyed, thus partaking in a new movement which addresses issues of today. But I also have the feeling that the grit and punch of the messages are gradually fading, as „when everybody is a revolutionary, the revolution is over“. Looking at some recommended artists and how they might influence my Approach. 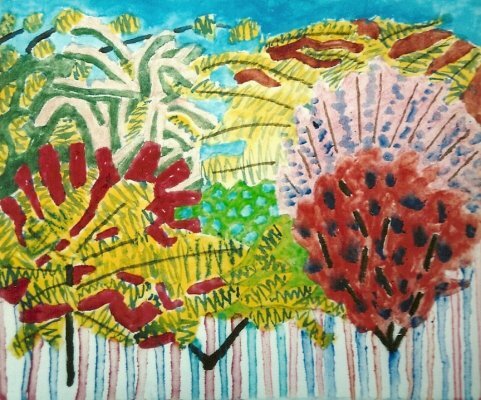 I had a look at Lisa Milroy on lisamilroy.net She went through a phase where she painted fast – finishing a painting a day, painting wet-on-wet. (Mostly still life paintings). 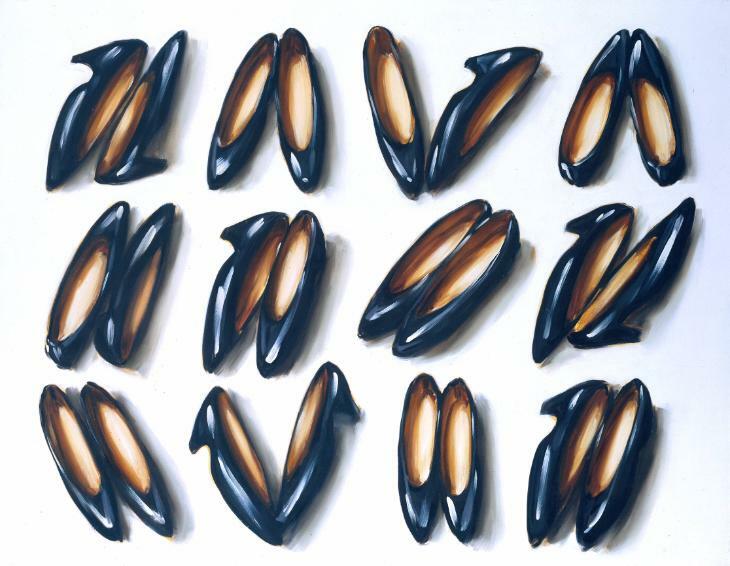 Around 1984 she turned to “slow Painting” taking months to finish a canvas. 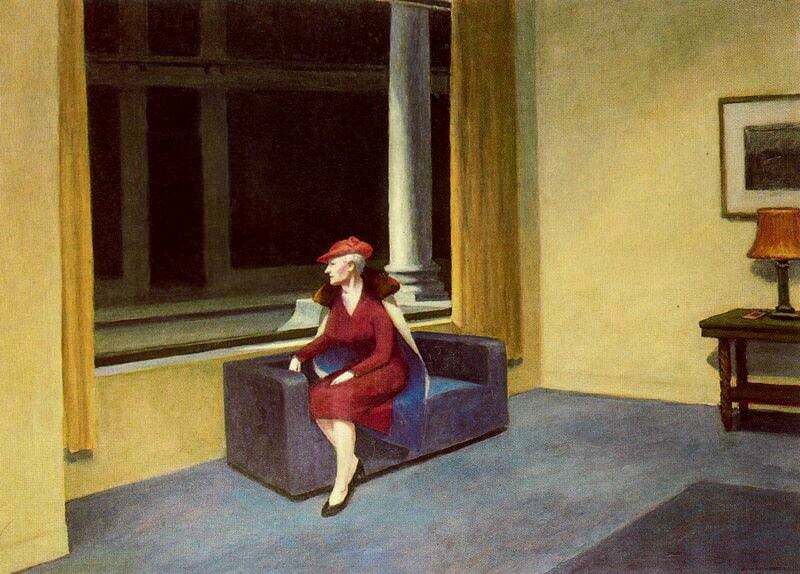 (like Edward Hopper). 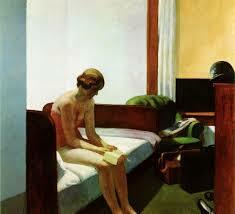 She painted on a white Background which heightened the effect of the shadows. “ The objects I chose to paint were usually beautiful or visually attractive and I wanted to celebrate that quality in paint”. Whilst I was painting my still-life flowers, especially the Hibiscus flower, I can remember that I was so enthralled by the beauty of it and attempted to “celebrate” it too. I found that giving it the black background raised the beauty of the flower, making it special. But it needn’t be only “beautiful” objects, I could also paint thrown cigarette butts, squashed cola cans, the litter I find on the street on my way to work. “While painting one such object I’d concentrate on trying not to think of anything other than pure description and the enjoyment of painting”. Yes, I remember that during the process of painting the still life flowers I was highly concentrated, locked myself into my world and did not let anything distract me. 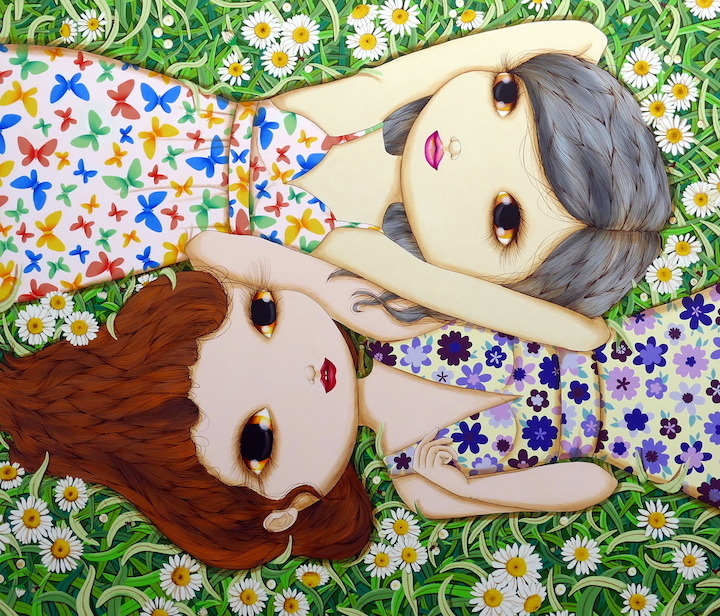 The paintings also took a few days, and I was glad that it was Summer and I had many flowers to refer to. I also referred to my photographs. She gave herself limits, finding her freedom in limits: She used only eight colours and mixed. – I use only three warm primaries, three cold primaries and white. I also use those wonderful pearly colours which I have in three tones. 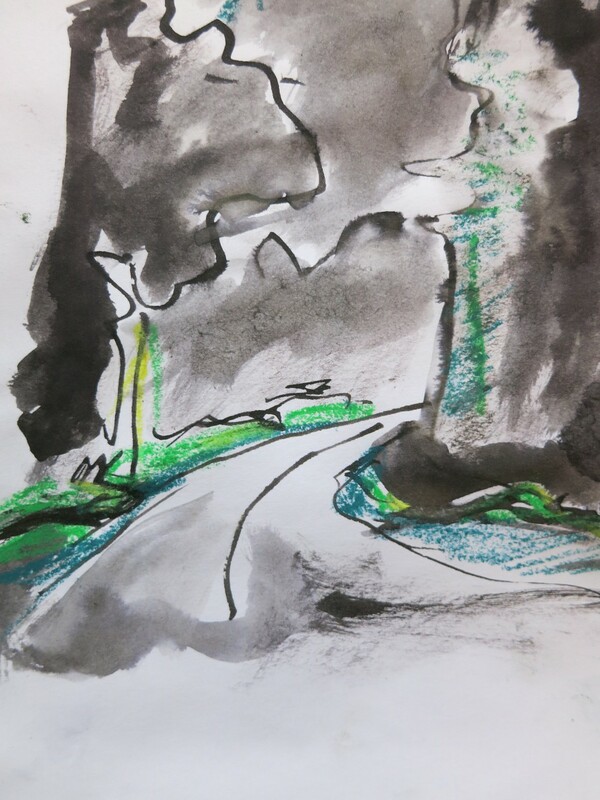 In the landscape projects, I have sometimes used only tonal shades of grey, which I found quite interesting. She used only hardware brushes: I have two favourite brushes and resort to using sponges, knives, batter scrapers to push my paint around. For larger paintings I use house painters brushes, mops, tile wipers, bamboosticks or whatever I lay my hands on. I tie the brushes onto broomsticks so that I can gain distance and be less controlled – but of course only on larger paintings. She tended to paint on canvasses of only one or two sizes: I notice that I love to use small canvasses of 30x30cms, 60 x 60, 80×80 or 100×100. For landscapes I have bought small rectangular ones too. I like the idea of painting in series. She painted her shadows always falling to the right. I would say that my light source is mostly always to the top right, so my shadows would fall to the left. Funny! I hadn’t given this a thought before. She made photos of her objects: I too had to photograph my flower. It was an exercise about painting from a photo, so I adopted this method, but also had the real flower before my eyes for reference. 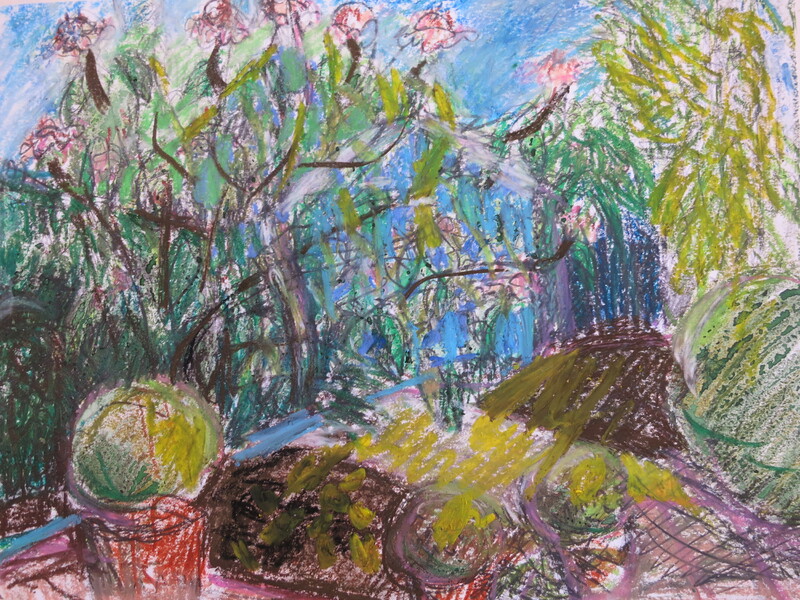 She turned to slow-painting in 1984: My flowers and the dragonfly were works taking more than one day. I don’t think I could do that in one sitting. Her slow paintings show a closed and melancholic atmosphere: Those flower paintings done on the 30×30 could be interpreted that way too. I had done a very large flower painting , which took me weeks to complete, and that painting certainly had something very melancholic about it. 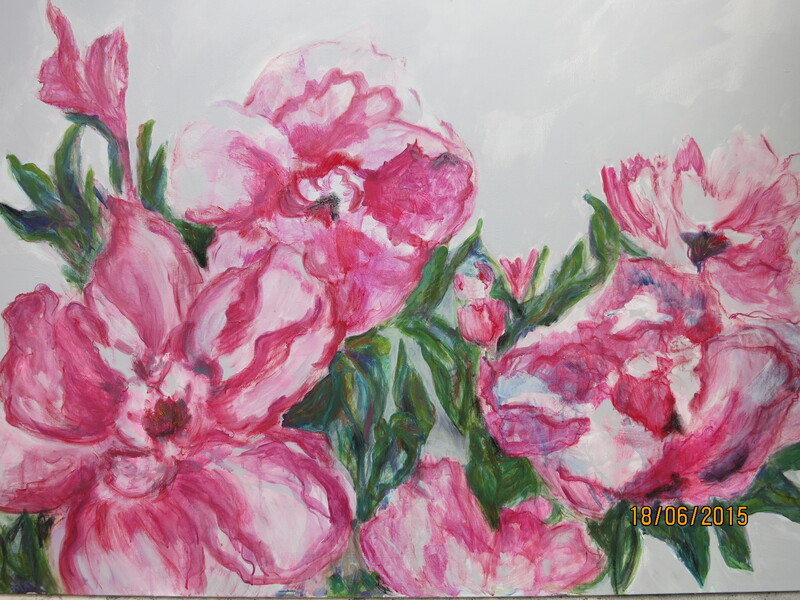 Whereas I had done a flower series on very large canvasses in a very spontaneous fashion and they create an atmosphere of freedom and exuberance, with happy dancing brushstrokes. I think she has a very interesting artist’s bio and writes interesting texts. Its important to be more open and write more about oneself and one’s thoughts. I am quite a reticent person when it comes to talking about myself, and I find it difficult to talk about my deepest thoughts, as it might bore the others to death. I’m afraid I make too many very deep thoughts. Would perhaps be easier if everything was on a light hearted level. I found it very interesting getting to know Lisa Milroy’s work. It gave me a lot of insight into how I could further develop my new found affinity (discovered during the Still Life project) to drawing and painting in a concentrated fashion in certain situations. I would like to have the time to paint a series of very realistic flowers, insects, leaves, fruits of my garden – all on 30 x 30cm canvasses. I also looked at Marcus Harvey, a YBA born in 1963. His portrait of a serial child killer made of children’s handprints created quite a sensation some time ago. “High art with gritty realism”. Not exactly my cup of tea. Kitaj( 1932-2007) an intellectual artist “of fierce intelligence” who was not understood – or who quoted too many intellectual sources much to the chagrin of some art critics. Was together with Freud, Hockney, Hodgkin, Auerbach. Very intensive colours. I could not relate to his work too much. Mick Rooney: (1944-) Delightful narrative scenes of poetic dreams. Its hard to believe that those are painted by a man. The faces were all rounded like gingerbread men. Looked at a slide show of his images on www.bbc.co.uk. I liked the Windy Day on Brick Lane on www.fossegallery.com. ADRIAN BERG: (1929-2011) I am ever so thankful that I have discovered this landscape artist who was inspired by Monet, treating subjects in series like him. He lived overlooking the Regents Park, which proved to be the perfect location for him. He recorded the passing seasons mainly from his window, but also in the park and other famous gardens. According to his website, www.adrianberg.com he deliberately blocked emotional response and forced the viewer to think. I looked at a wonderful slide on bbc.co.uk and was quite enamoured with his jewel like colours and his paintings of the seasons and even months of the year. 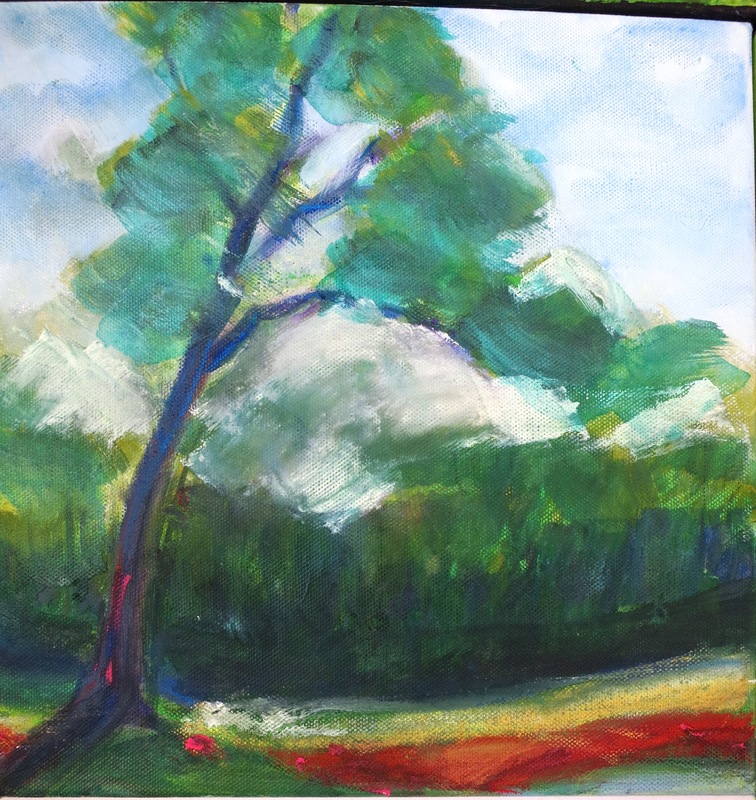 This painter inspires me, as I admire his sense of colour and the fact that he spent a lifetime exploring his parks, landscapes and trees in quiet solitude. I don’t think he was successful in his attempt to block an emotional response – I was absolutely involved seeing his colours. Discovering him has enriched my painting life. Such jewels! 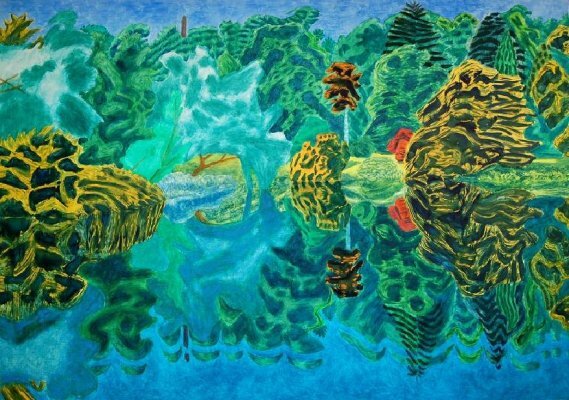 To add to this I love this humbleness – he worked as a teacher and was not keen to exhibit and create a fanfare – “merely” partaking in the annual Summer Exhibition at the RA. He was at the Academy with David Hockney. Personally, I prefer Adrian Berg’s work. I enjoyed his drawings too on his Website. Hope to see his works at an Exhibition. It’s a pity that I did not discover this great colourist before. But I am richer now. 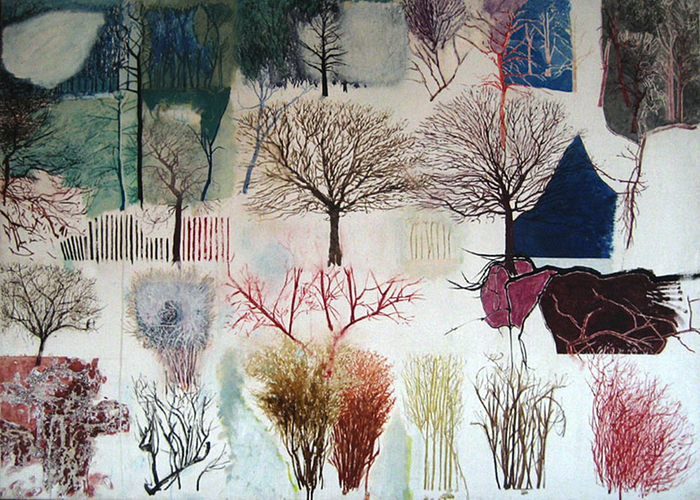 Some paintings of mine where I was engaged in observing trees, seeing why I love his style of painting. 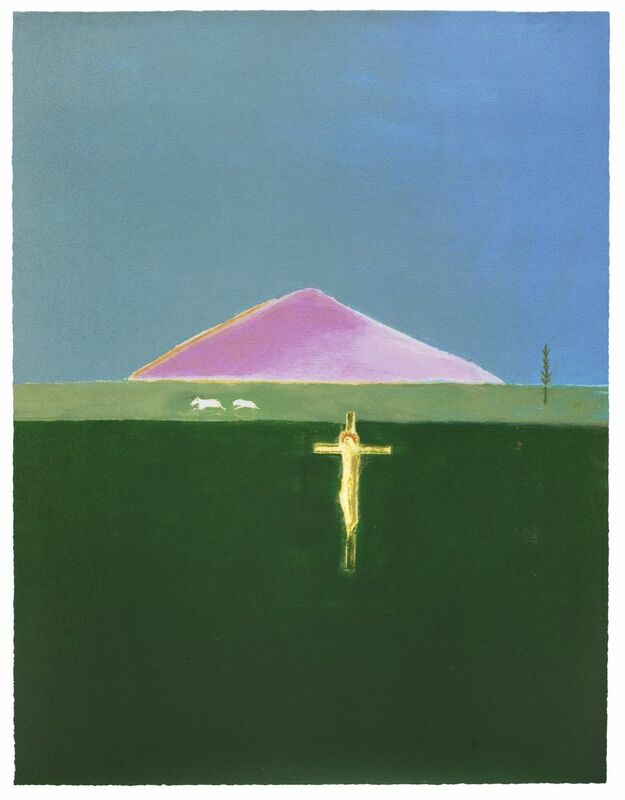 Looked at Craigie Aitchison: glowing colours on minimalistic background. Very austere paintings but a touch of glowing pinks and some lovely blues. He seemed to have a thing about that triangular hill form and also to be quite religious as the crucifix appears as a theme in most paintings. 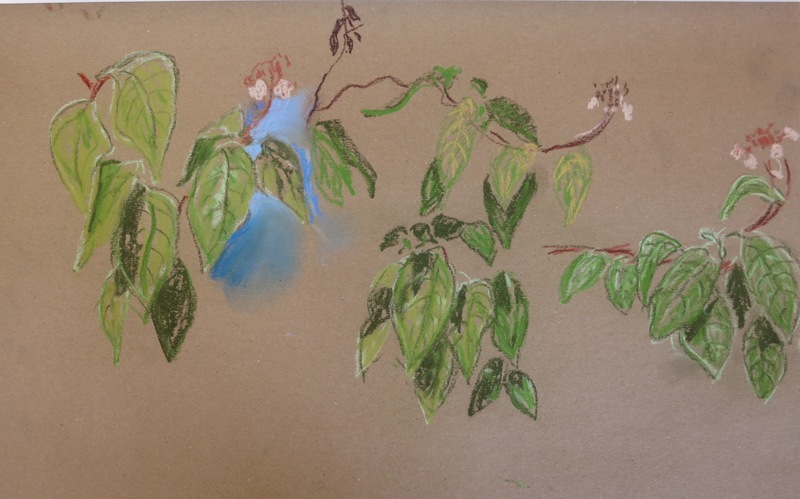 Fazit: Researching Lisa Milroy and Adrian Berg have given me an impetus into looking closely at more objects of nature and rendering them in a realistic style as I did my hibiscus and the dragonfly. 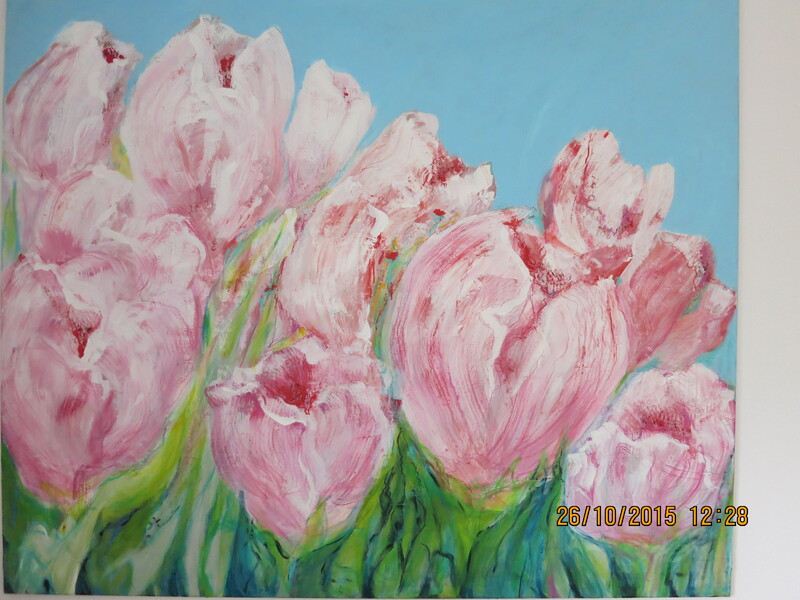 I have already done some roses, an iris and other flowers of my garden. The insect series would also include ladybugs, and other humble creatures. 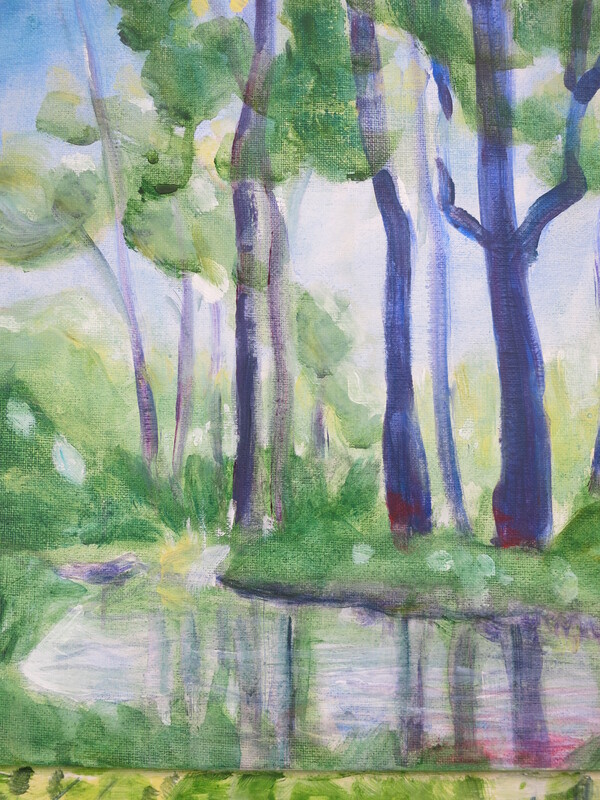 Need more time for all – but its on my to-do list.I also notice that I could do with more serenity and calmness (like Craigie Aitchieson), as looking at my older paintings from last Summer I tend to be very “busy” in my trees. Lines and lines all over. – So I feel that working on those flowers (Hibiscus etc) was a good exercise in working slowly and calmly. Its always good to take time to distance oneself from one’s work – as the critical eye works better then. 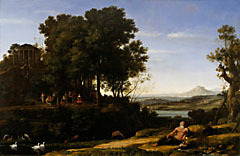 Pure landscape painting was not considered „real“art and was used mainly as a background for a figur painting. But in Northern Europe, especially Flanders, landscape had grown to be a genre in it’s own right. This interest in the „background“ was awakened with the rise of protestantism. In Protestant Holland artists turned to new themes to replace the religious one and artists like Meindert Hobbema, Salomon van Ruysdael (1603-1670) and Jakob van Ruisdael (1628-1682) had a great influence on the english taste in the following century. „Good taste“ ruled out the horrors of nature and a refined, tamed nature was deemed preferable. This also had an influence on english garden architecture. Richard Wilson (1714-1782) is considered the „Father of English Landscape Painting“. While he was working in Italy as a portraitist, Zuccarelli advised him to take to landscape painting. 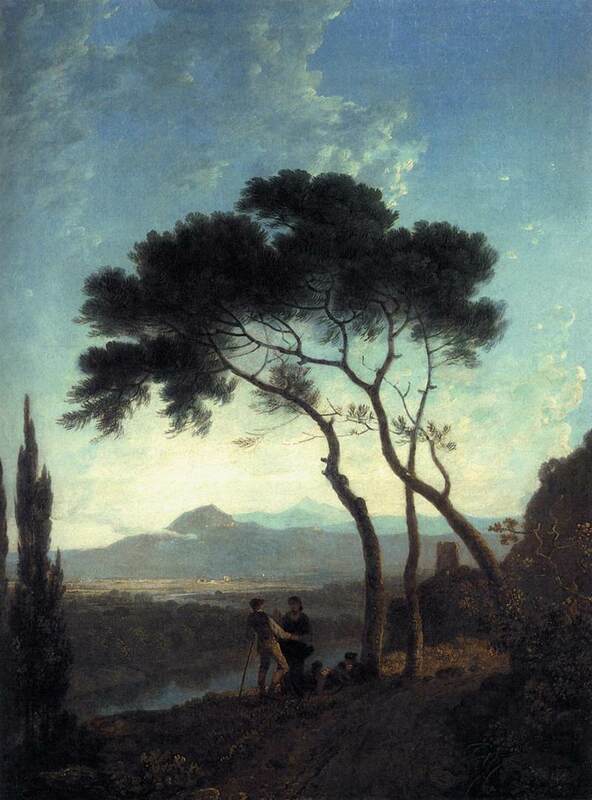 He was influenced by Claude Lorraine depicting romantic but less idealised vistas. Before Wilson, artists sketched from nature and returned to their Studios to produce idealised paintings, but Wilson painted plein air and what he saw. On his return to Wales he concentrated on his surroundings, drawing attention to the Welsh landscape. He painted plein-air – depicting what he saw and what was in front of him. 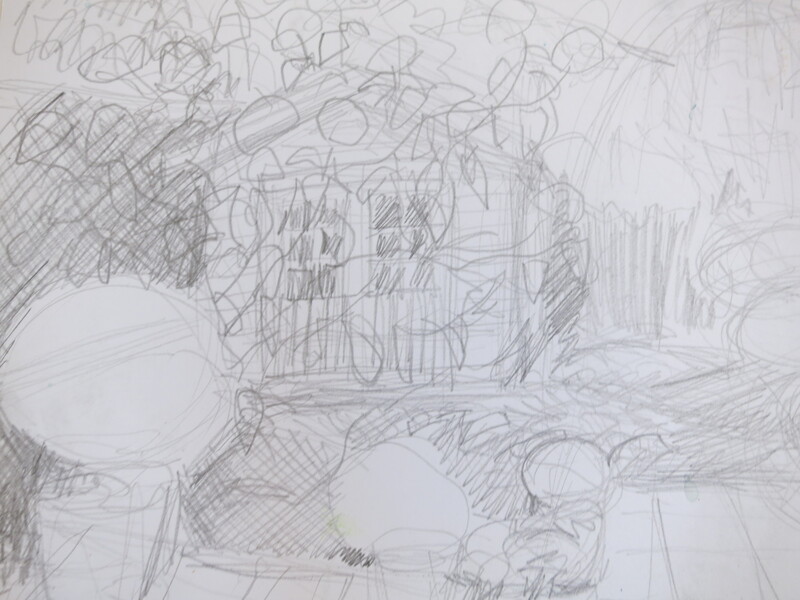 Upto then artists had sketched plein air, but returned to their studios to paint. He inspired John Constable and Turner to literally follow his footsteps and to paint from exactly the same spots as he had done. He also made a change to the custom of depicting the country houses, which were, upto then, the main point of interest in the painting. Wilson placed them on a side, like Lorraine did with his edifices, something that Constable also followed. But all in all, in spite of his great influence, he died as a pauper. I like the fact that he painted plein air and that he later concentrated his attention to the landscape of his home area. This is something I do too although in a much more painterly manner leaving out most details. 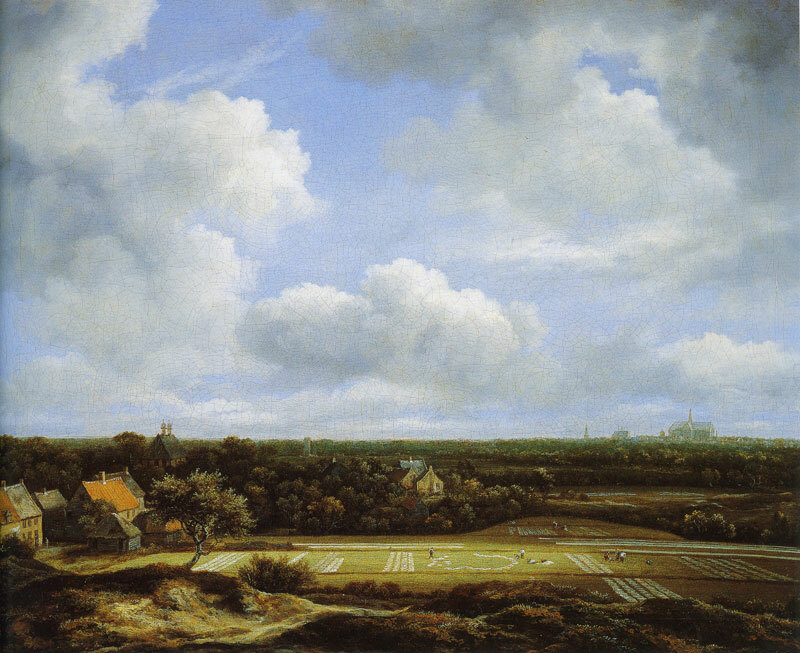 Meindert Hobbema (1638-1709) was a dutch „GoldenAge“ landscape painter. According to documents he was taught by Ruisdael, but his master’s influence is not apparent until after 1660. 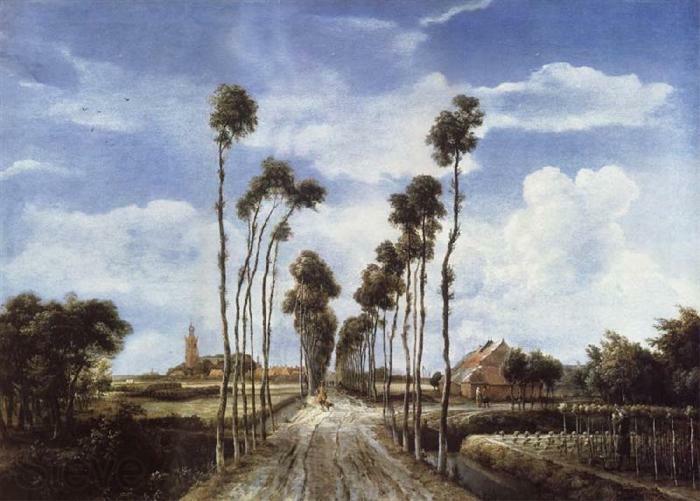 His earlier works were influenced by Ruisdael’s uncle, Salomon van Ruisdael. His favourite themes were the woodlands of the eastern Netherlands, the unpaved roads, watermills, ruins and water. The famous work, „The Avenue at Middleharnis which he painted in 1689 hangs in the National Gallery, London. Although he painted less after he married, he is considered one of the most characteristic and valued Dutch landscape painters of the 17th century. He was influenced by Ruisdael’s composition, but developed his own lighter hand. He gave up art to work as a wine-gauger, but nevertheless his most famous painting, „The Avenue“ was painted 20 years after he started work . He died as a pauper. Claude Lorrain (1600-1682): an influential landscape Artist of the Baroque, who influenced not only English landscape art, but also garden design and even literature. The romantic artists, J.M.W. 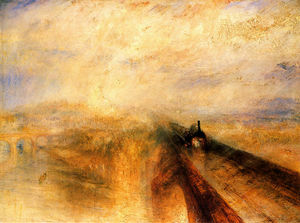 Turner, John Constable and Samuel Palmer were influenced by him. 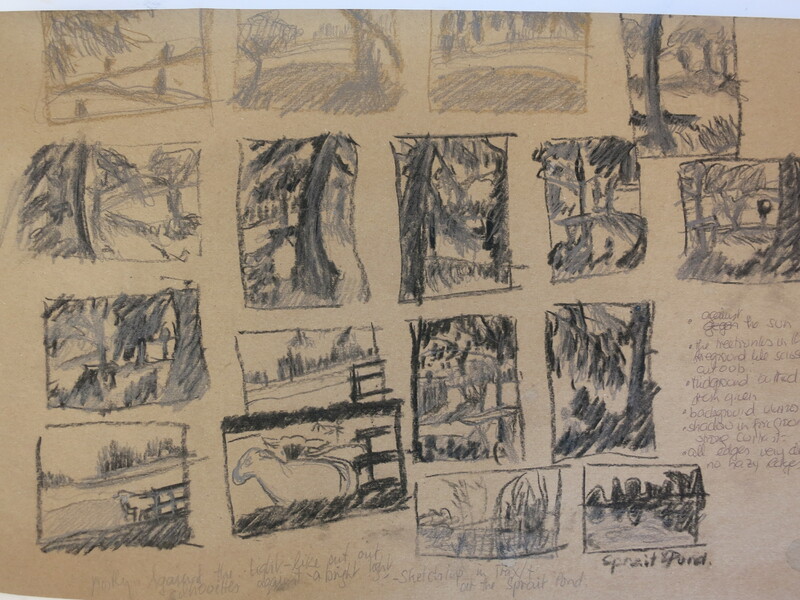 I like the fact that he made myriads of drawings and sketches plein air before he decided on his final composition. This is something I like doing, but in my case the final paintings are invariably robbed of some of the directness and urgency of the rough sketches. 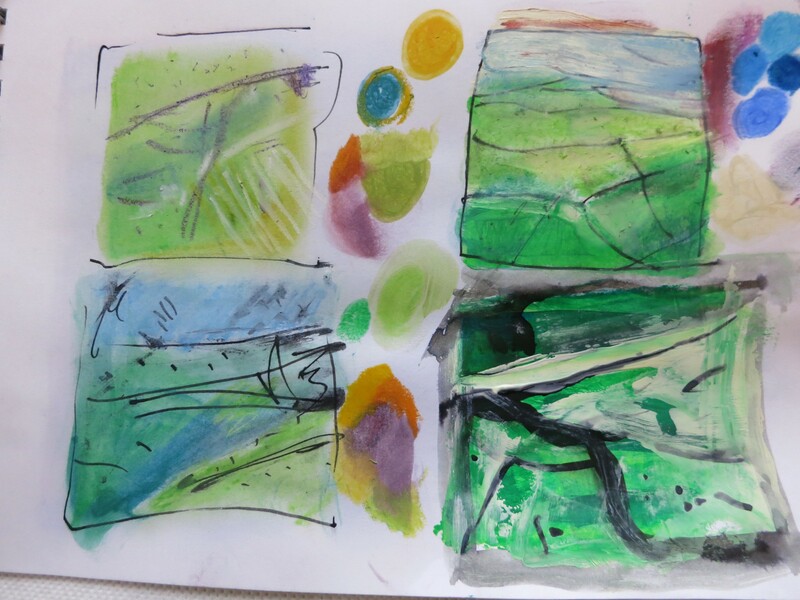 My sketches can be lively and authentic, but often the finished painting can be quite stiff and dead. Claude Lorrain Apollo and the Muses, 1652. 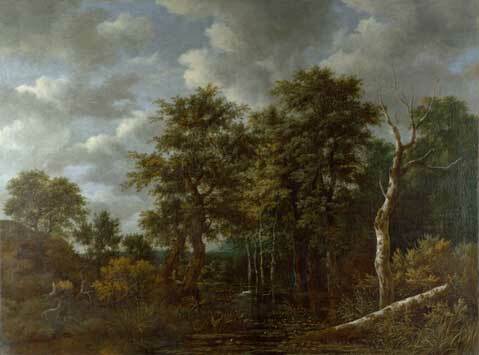 Jacob van Ruisdael:(1628-1682) was a Master landscape painter of the Dutch Golden Age. His early works were of the Flemish landscape with low horizons and dramatic skies. In 1650 after his move to Bentheim with it’s hilly landscape, he introduced ruins, craggy mountains, waterfalls, stormy skies, decaying trees as symbols of the transciency of life and human situations and to give a deeper sense of perspective. He intended to create paintings of mood by using his imagination. 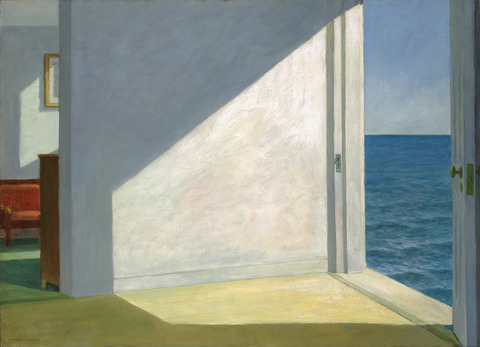 It was not a specific landscape or place that he wanted to depict, but a „sense of escapism“. These were moody, brooding dark images. After spending some time looking at his works I can perhaps admire his technical skill, but at the moment I cannot identify with those overly worked trees and boughs. I know that he is considered as „one of the greatest Old Masters of the 17th century, but I feel uneasy with so much precision as an all over effect, even more so as I learned that most of the objects which he introduced onto his landscapes were either appropriated or done according to a pattern or scheme. What I could emulate is the fact that he introduced new methods like impasto to create a certain 3-D effect. J.M.William Turner(1775-1851): „The Painter of Light“ who raised landscape art to importance. I always have admired his beautiful skies and his treatment of light. 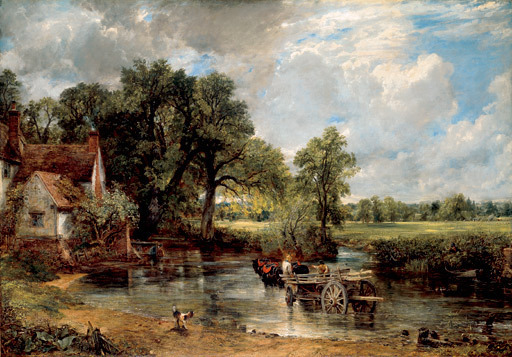 John Constable (1776-1837): I like the fact that he concentrated on his immediate surroundings, his „Constable Country“, and that he loved painting his own places, which is also something I like to do, as I can return to these spots at different times of day, or year and sketch them in different light and seasons. 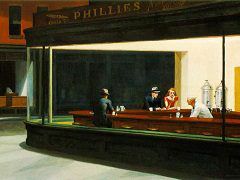 I also like the fact that he painted scenes of ordinary life. Something very Morandi-like and humble about that. He said that imagination alone is insufficient and that reality is also vital. He too made many full scale sketches to check the composition before starting off on the final. That’s something I could adopt. He recorded weather conditions and wrote pertaining notes on the back of his studies – all inputs which I could introduce into my own practice. Ivon Hitchens(1893-1979) – panoramic landscapes with blocks of colour. I love these fields of colour with little or no detail. Peter Lanyon(1918-1964) A cornish landscapist – Abstract, vigorous brushstrokes and lots of my favourite blue. I find his an interesting body of work and must look at is work closely later. 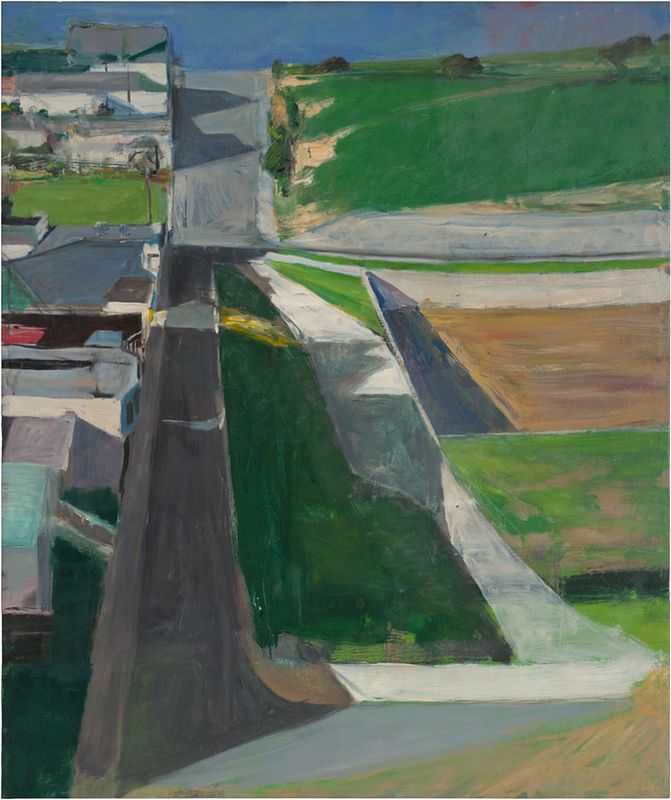 Richard Diebenkorn(1922-1993) – I love his interesting abstract landscapes, especially his inspiring ocean paintings. I looked at the work of Richard Long (1945-) a Land-art Artist who walks and measures using found objects to create his artworks.He never makes alterations to the landscape, but marks his chosen places with stones. He also paints with mud using his hands – like the women who paint their mudhuts with earthbased pigments using their hands. For him walking as art was his way of exploring time, distance, terrain somewhat like the aborogines during their walkabouts. I find his approach to use the pigments of the area to create very site-specific artworks interesting. I’d like to try this painting with mud approach when doing some artwalks along our local river. The mud would contain not only all the sludge, toxins and the negative imprint of man on nature, but also contain the DNA of the river – from source to point of extraction. I found this quite an interesting Approach and collected some mud from our river Isar to try out some experiments. 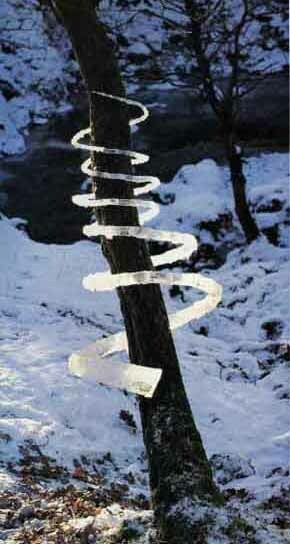 Another very interesting Land-art Artist I discovered was Andy Goldsworthy(1956-). He sets out with no idea what he wants to create and lets the materials he finds show him the way. He uses photography to record how his work grows and decays. He uses flower petals, icicles, leaves,mud, pinescones, snow, stone, twigs and even thorns to create. I like this idea of setting off with no preconceptions and using what one discovers to be inspired to create. These land artists are reverting to nature as a source of materials – like children who roam through their terrain letting their creativity run riot. To round off this extensive list I would like to mention James Turrel(1943-) a US Land-Artist who works with space and light. His studio is the sky. (He happens to be a pilot too). He says: „We are living in a reality of our own creation“. and want to create „an experience of wordless thought“. He creates other-worldly light spaces – „landscapes without horizons“. I rather like this idea of moving into this realm of landscapes without horizons and of reducing art down to light. This gets me inspired to get back to my vast canvasses of blue. I like the recording Constable did on light, weather etc and that he did many preliminary sketches. I could adopt this discipline perhaps so that I could finish off work in my studio. I tend to do rather vague sketches. I actually prefer working plein air. 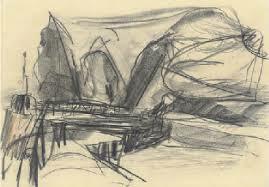 I love those blocks of colour on Ivon Hitchen’s work and feel encouraged to leave out detail and to carry on with my habit of using very broad brushes and enjoying my brushstrokes. But then I wont be learning anything new as this is something I like doing already. Peter Lanyon’s work inspired me to carry on with my love of blues. Here again his vigorous brushstrokes also inspires me to unearth my broad brushes. 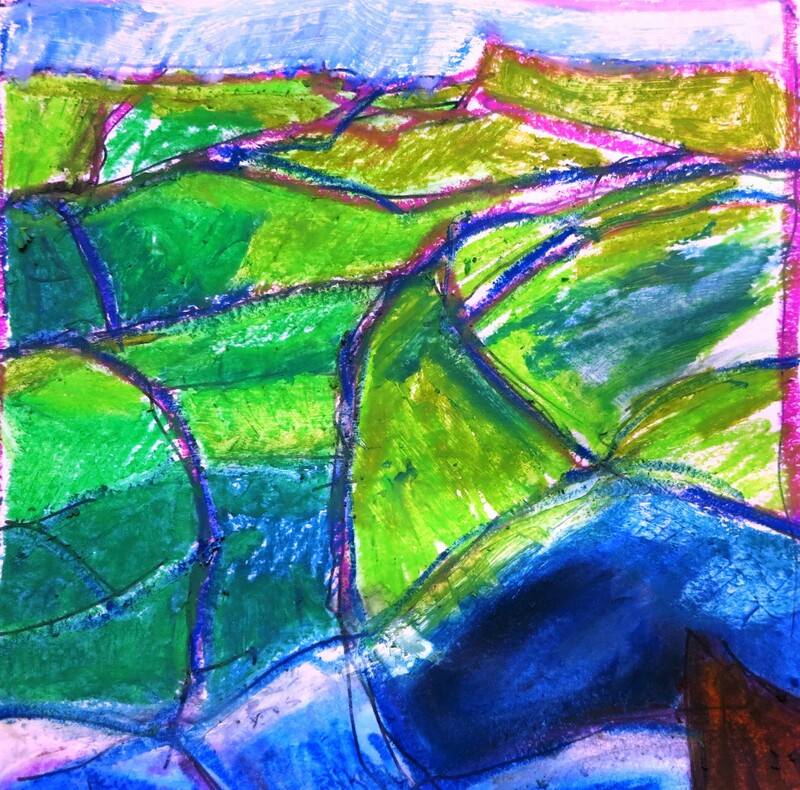 James Turrel’s saying: „a landscape without a horizon“ and his light-bathed spaces inspire me to create hugh canvasses of monocolour – with thirty or forty glazes to create a feeling of great depth. 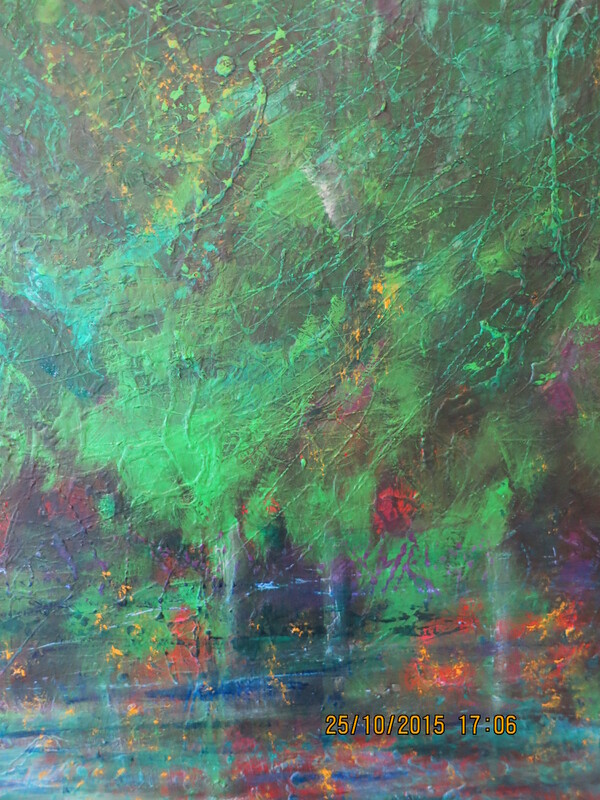 I cannot work with real light, but with pigments and glazes this astronauty feeling of weightlessness might be achieved. I remember some large canvasses which I had done some time ago using pure pigment and self ground Lapislazuli, turquoise and other waste semi-precious blue stones to create an expanse of weightless colour. It did have an unearthly effect on one. I didn’t think of them as landscapes before, but now I feel I must appropriate his expression and call them a landscape without a horizon. I also like the idea of using found natural objects to create transient statements in nature. You make these objects out of what you find there, photograph it and then leave it there for nature to take it over again. Very ecological – no toxic paints, no plastics, no unnecessary waste.